The city life can be suffocating and constricting. There are times that you would have to take yourself out of the streets of the crowded city and go to a place where you can have a breath of fresh air. Away from the city life and on to the mountains! Well, if mountains are too extreme, why not the rivers? But you can’t get there without the best mud tires on the planet fitted on your off-roader! Your H/T tires will bring you to a lot of places with paved roads. But here’s the thing, the places where you can go would be quite limited. If you plan on traversing rivers and scouting the mountain range, you would need a special tire for the occasion. To have traction on wet, muddy, and rocky terrains, you would need big tires with big grooves. Regular tires would just easily slip on these kinds of terrains, and you won’t even reach the camp! All terrain and mud terrain tires have more traction to climb and cross challenging roads. However, there is quite a huge selection of different tires on the market which makes choosing the right one for you a little confusing. But let me tell you this! You have come to the right place! We will show you which tires are the best for your needs! With more than 100 years in existence, Goodyear is one of the top-notch brands that manufactures tires around the globe. The company was founded in 1898 which makes them 119 years old now. They are based in Ohio and have manufacturing factories scattered all over the world. In the 1900’s they were known for building Airships that are used to capture aerial shots and fly advertisements. This tire is made with a superior radial structure that has a 105S load index. It can safely carry up to 2028lbs of weight individually. The sidewalls are labeled with the branding and have two faces. You have an option to have the white-painted branding or have the regular side with embossed letterings. This tire is 235mm wide, has 175mm sidewall, and fits 15inch wheel. You get more sidewall which means that your tires will have more air inside. The ride quality will be more comfortable as the tires would have more room to for the air to absorb impact. This tire is meant to be used for light off-road applications with wet terrain and some mud. However, it would be a little noisy when driven at high speed on paved roads. This tire is made with a radial structure that has excellent durability. 235mm tire width would give you more traction on wet and muddy terrains. This product has excellent load capacity. The wider sidewall will absorb more impact. This tire is a little noisy when driven on high speed at paved roads. Hankook is a company dedicated to contribute to the advancement of driving and improvement of the overall ride experience. By inspiring drivers to take on more challenging terrains and ways of driving, they are able to adapt and improve the best that they already have. With their clients in mind, they make their best effort to make sure that every person enjoying their products are safe and secured. To be true to their promise, they see to it that their methods and applied technology are up to date. This tire has a 235mm width and has a tall sidewall. This tire will fit a 15in wheel without a problem. The 175mm sidewall translates to more air inside the tire that can absorb the impact of the ride. There will be more air to absorb the impact of every bump. With a tall sidewall, this also means that you won’t be damaging your wheels in case there are drops and potholes. It has a load index rated at 109T. If you will be hauling a few heavy stuff with you on your getaway, you can safely stack up to 2271lbs without a problem. The groves of the tires are enough to give you traction on rocky and muddy terrains. This set of tires is covered by a limited one year warranty and a 50,000 miles treadwear warranty. The company will honor your claim with your receipt given that the tires have been damaged while using it under normal and specified circumstances. This all-terrain tire comes with one year warranty that is coupled with a 50,000 miles treadwear warranty. It can safely withstand a payload of 2271lbs. Using this tire would make your ride a little less bumpy. This tire works well in mud and snow. This tire decreases mileage a few points. May not have enough traction on extreme muddy conditions. Hankook is a Korean brand that is known globally for manufacturing high-quality tires for highway terrain, mud terrain, snow, terrain, and other extreme applications. They are currently the 7th largest tire manufacturer in the world and has more than 22,000 employees on their roster. Their 77years in existence only proves that they have mastered their craft and they are truly a trustworthy brand. This tire model will fit most of the latest mid-size trucks and SUVs without the need to lift your car. These may be slightly larger than the original tires fitted when you got your automobile from the dealer. If your vehicle comes with a 17” mag wheel, this tire will perfectly fit without a hassle. The grooves are rugged-looking and give your vehicle an aggressive look. The sidewalls have tiered grooves for better cornering even on rocky plains. This tire is durable and resists puncture very well. You don’t have to worry about your tires being easily cut by sharp rocks. These tires are rated for snow and mud conditions. It has a tread wear indicator that shows how much rubber you still have before you need to replace them. This tire is rated with a load index of 113 that translates to a maximum payload of 2535lbs. You can haul large stuff without a problem with these tires. The tires give your ride an aggressive look. It has a 113 load index rating for hauling heavy objects. The wider track gives you more traction. This tire is good for mud and snow. Tiered sidewall grooves give you more traction while cornering on difficult terrains. Depending on your vehicle specifications, this may have a little rub on the front when cornering. A little noisy on high speed. In 1954, Federal Corporation was found in Taiwan by Ma Chi San. They initially targeted manufacturing tires for Mainland China. Through a technical operation with Sumitomo Rubber Industries in their initial years, they have developed durable and top-notch tires that are reliable and withstand extreme conditions. Today, they are one of the most-sought-after affordable brands that deliver durable tires. For lovers of the extremes, this mud tire can take you to places you’ve never been. It has a wide track, 265mm, that gives you excellent ground traction on all kinds of terrain. The tire grooves are widely spaced to easily claw on mud, snow, sand, and other difficult terrains. The grooves feature an ejector to keep free from stuck mud and stone and provide excellent traction on challenging terrains for the length of your ride. The manufacturer designed the shoulder lugs to be large and aggressive to make sure that it can resist bruises from an impact. The tires are made with 10ply material that would not easily get cut by sharp stones. The smaller rim allows more air to fill the tire and give you more impact absorption. These tires can carry up to 3085lbs safely without a hiccup. These tires give excellent grip on challenging terrains. It gives an overall aggressive look to your ride. Will fit most of the latest mid-sized trucks and SUVs without lifting your ride. Made with a 10ply durable rubber material that resists puncture and bruising on impact. These tires are noisy on the pavement. Fuel consumption may increase with these tires. Falken Tire is a 35-year-old company that manufactures all kinds of tires including passenger tires, highway terrain tires, and extreme application tires. This Japanese company is owned by Sumitomo Rubber Industries that has been in the rubber business for more than 100 years. Falken just recently entered the off-road arena and already have a huge selection for your extreme sports and hobbies. This all-terrain tire is designed to get you through mud, snow, sand, and other extreme condition. This tire is manufactured using heat diffuser technology that dissipates heat on the lower sidewall to protect your tires from overheating, especially when carrying heavy loads on challenging terrains. Falken uses a 3D Canyon Sipe Technology that connects the shoulder of the tire to the sidewall. This feature also improves the handling of your vehicle dramatically. This tire is built to resist puncture and cuts from sharp stones and other hazardous objects in the terrain. It is rated with 115 load index an can safely accommodate up to 2679lbs. These tires are most sought after their performance in the snow. This product is from a trusted Japanese company. It features a heat diffuser technology that dissipates heat and keeps the tires cool even at high speeds and with a heavy load. The 3D Canyon Sipe Technology improves durability and handling of your vehicle. These tires have great traction on snow and mud. The shoulders are durable, puncture, and cut resistant. These tires may reduce your mileage. These tires have shallow grooves. Nokian Tyres is a Finnish company that is situated in Nokia, Finland. They have been manufacturing different types of tires for 86 years and have a wide range of selection available globally. They are most notably known for their snow tires that are designed to withstand the extremes of nature. They aim to design the best tire for every condition to maximize traction in every type of terrain. Nokian Rockproof tires are designed and made to resist rocks and bring you to places where all-terrain tires can’t get you to. These tires have extreme durability and would not easily give in to challenging terrains. The rubber is made with advanced compounds that resists cuts while having the best traction in extreme conditions. They are made with similar materials that heavy machines use to perform and lift heavy loads in extreme conditions. The tires have aggressive groove patterns that give your ride an intimidating presence. This tire has a 285mm width to give you excellent grip on every type of terrain. Nokian Rockproof tires feature Aramid fibers that give the sidewalls excellent durability. The shoulders and grooves have stone and mud ejectors to facilitate easy removal of stuck debris and give you excellent traction in sand, mud, snow, and other challenging terrains. These tires are made with outstanding craftsmanship and excellent durability. They are manufactured by a well-known tire maker that specializes on extreme applications. The sidewalls of the mud tires are fitted with Aramid fibers that enforce and enhances the durability of the tires. Stone ejectors will facilitate easier removal of stuck debris. These are built tough and built to last. These tires are heavy and will increase your fuel consumption. They are quite noisy on paved roads. You would need to lift your ride to have them fit. BFGoodrich is the first to manufacture the radial tires that we know today. Many other tire companies followed their lead and incorporated their designs as it was found out to have superior durability over other types of tires. This American brand manufactures a wide selection of tires designed for extreme conditions. They are known for extreme durability in high-speed racing and tough build in off-road and other challenging terrains. These large mud tires are meant to be abused on extreme condition and come out in one piece. This tire has a total height of 35inches. The width of the tire is 12.5 which gives you excellent grip on whatever type of terrain you are on. This mud tire fits a 17-inch rim and has a load index rating of 119 that can carry almost 3000lbs. The sidewalls are built with a tough 3-ply rubber compound that resists cuts and bruises. 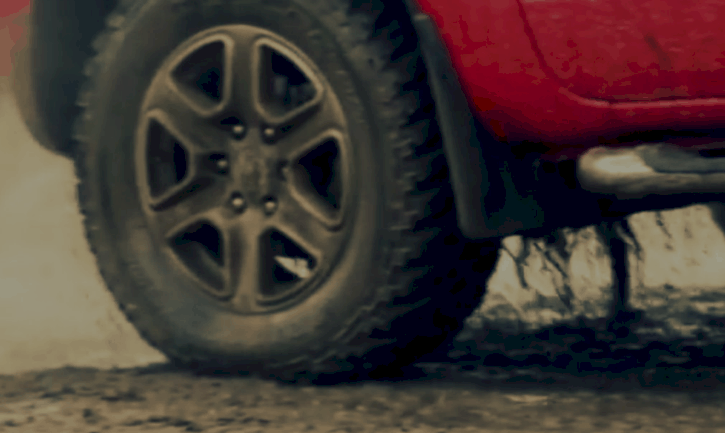 You can take on rocky terrains with sharp protrusions without worrying about damaging your tires. With the large grooves of the tire, you can claw on soft and muddy terrains without a problem. This tire gives you a great advantage over soft muddy terrain. It has stone and mud ejectors on its grooves to keep you going longer without harboring debris stuck on the grooves. The sidewalls are reinforced with a 3-ply tough rubber compound to resist cuts from sharp rocks and stones. This tire is manufactured by the pioneer of radial tire design technology. The 12.5inch width gives excellent traction over any terrain. Makes your ride look like a tough monster. You will need to lift your vehicle to have them fit. Not optimized for snow terrain. Being the pioneer of the radial designed tires, BF Goodrich has advanced their designs and improved their durability way before their competitors. They are one of the most sought-after brands globally today, and they continue to research and improve their already tough tires. They even manufacture tires for airplanes as the quality of their make meets aeronautical standards. This radial tire has 285mm of width and provides traction on all types of terrain. The high sidewall gives more room for the tires to absorb impact and improved user comfort on challenging terrains. It has a load index of 121 that can safely mount up to 3197lbs. BF Goodrich uses their CoreGard technology on the sidewalls to make them tough and resist cuts and bruises from impacts. They extended the shoulder and made it thicker to resist deformation and improve the handling of your ride. The grooves are designed to give maximum grip without producing too much noise when driving around the city. This tire is engineered to have excellent traction even on wet surfaces and snowy terrains. This product has a high load index rating that can safely haul up to 3197lbs. The extended shoulder improves handling and increases the tire’s resistance to cuts and bruises from an impact. The grooves are designed to give excellent grip on with reduced noise. The shoulder grooves have stone ejectors. It has great traction on wet and snow terrain. This tire won’t fit your stock vehicle, and you may need to lift your ride. These tires are quite expensive. Cooper was established in 1914 in Akron, Ohio. They are now more than a century old and still doing business. Cooper is known as one of the most trusted brands in the US and worldwide. They started small and manufactured tire patches and repair kits. Today, they are one of the leading brands that manufacture all kinds of tires for a wide selection of applications. This all-terrain tire by Cooper has 265 of width and would fit most of the latest mid-size trucks and SUVs without having a body lift. It has 185mm sidewall height that has enough space to absorb impact while driving on challenging terrains. This tire fits 17-inch mag wheels. This radial tire has a five-rib design that is meant to take a beating on all kinds of terrain. It has excellent traction both on paved and unpaved roads. They use a silica-based compound that gives outstanding traction on wet and humid terrains. The geometrical pattern of the tire grooves has lesser noise when driven on the pavement on high speed. It has a load index rating of 115. These tires can safely haul up to 2679lbs. This tire is not as noisy as the other all-terrain tires. The silica-compound makes this tire a great choice for wet conditions. This tire fits most of the latest vehicles without using a lift kit. It is made by a well-known brand. Not the best tire for snow. The tires are quite rigid and give a stiff ride. Cooper, with more than 100 years in existence, has mastered the craft of manufacturing tires for every application. In 2013, they were hailed as the second largest tire manufacturing company that is most sought-after by vehicle owners. This tire has the same overall size, quality, and applications compared with the previous model. The only difference is that this tire fits a 16inch wheel and has a slightly higher load index. The quality of ride will be more comfortable because of the taller sidewall that accommodates more air that absorbs impact. This tire is made by a leading brand that is known for quality and durability. It fits most medium trucks and SUVs without needing a body lift. The tires are remarkably quiet compared to similar designs. The smaller rim specification means a more comfortable ride even in challenging terrains. There are better snow tires than this. The mud terrain and other difficult terrains are meant to be traversed using proper gears. Your H/T tires won’t make the cut and will get you stuck. The best mud tires, however, will bring you to places that no ordinary vehicles can explore. Scouting unpaved roads require some aggressive tires. Mud tires and all-terrain tires are versatile tires that can overcome obstacles in unpaved areas. It has a better grip on soft and muddy terrains. With these versatile tires, you can traverse dunes, shallow fords, mud, and even snow. These tires are built tough and built to last. They are excellently crafted to resist cuts and bruises from unforgiving terrains. However, there are some other considerations you need to think about before buying a tire for your adventures. Here are some of the things you need to consider to end up with the best mud tires. Off-roading is a hobby that requires, first and foremost, an off-road capable ride. Off-road capable vehicles don’t come cheap. You will also need additional modifications to make them thoroughly capable of challenging difficult terrains. The tires don’t come cheap, and you need at least four of them. Having a spare tire would be an essential, necessary preparation in case you encounter a mishap during your adventure. Depending on the difficulty of the terrain you want to cross, bigger mud tires will give you more advantage and lesser risk of getting stuck. As you increase the size of your tire, you exponentially increase the cost of each tire. Aside from the cost, you can’t just increase the size of your tires without increasing your ride height. Larger tire circumference will need more room that’s why a body lift would be necessary. Now, depending on your preference, you may want to increase or decrease the size of your mag wheels. A larger wheel will give you better steering control. However, remember that as you increase the wheel size, the sidewall of your tire may decrease. If you opt to increase your tire size, you would have to increase your vehicle height to accommodate bigger wheels. On the other hand, a smaller rim will give be able to accommodate tires with taller sidewalls. This accommodates more air and increases the ride comfort as there will be more air to absorb impact. On the other hand, this may decrease handling. To be able to come up with the right set up, its best to determine how you plan to use your off-roader. Figure out, in advance, the places you want to visit. You can ask people who have already been there about the challenges. You can also ask about the right types of tire, and the right vehicle height to overcome the challenging terrain. This will give you an idea of how you should upgrade your off-roader. An SD card slot is another way to play music through your head unit. If you don’t have Bluetooth connectivity, this auxiliary input enables you to play supported music files through your head unit. Even with the right set-up, you may still end up getting stuck on soft mud and other difficult terrains. With the right recovery tools, your buddy, or a tree, can give you a boost. Hitches, winches, recovery boards, jacks, and other tools will make the adventure safer, and fun! To be able to traverse muddy terrain safely, you will need the right mud tire. An all-terrain may do just fine but may fail you in extreme conditions. However, A/T tires give you more flexibility whole year round. Overall, in this round-up, BFGoodrich Mud-Terrain T/A KM2 All-Terrain Radial Tire - 35x12.50R17/D 119Q wins in all aspects when it comes to overcoming muddy terrain and is the best mud tires you can get your hands on. It gives you excellent traction even on the most slippery and muddy terrains. It has tough shoulder profiles that resist cuts and bruises from sharp stones. It is made by one of the biggest manufacturers of all kinds of tires and has excellent customer support. The tires are 12 inches wide and can give you outstanding grip even on paved roads. The large circumference of the tire will help you cross large gaps without a problem! Although they are expensive, it will make traversing muddy terrain with is. You may also need to lift your vehicle a few inches to accommodate them. However, it will make your ride look more aggressive and intimidating.